Our Verona clinic provides chiropractic care for infant children. Gently realigning the spine can aide in the digestive process and eliminate colic and fussiness. During pregnancy the infant spine is perfected; however, misalignment can take place while in the womb and during the birthing process. Gentle chiropractic pediatric care is a positive treatment for an infant. There are a number of signs that could implicate a spinal misalignment. One indicator can often be seen in the birthing process through the use of forceps, a C-section, or a traumatic vaginal birth. Other indicators can include: digestion problems, colic, fussiness, not nursing on one side, the head being held in a slanted position, and more. Some babies have been known to stop fussing during the gentle, soothing manipulations and to fall asleep peacefully. Results from the spinal adjustments can be seen indigestion problems vanishing, peaceful sleep and the disappearing of all adverse symptoms. 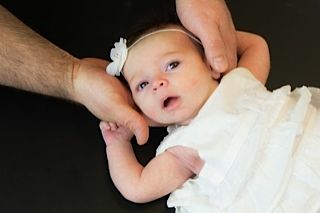 Our Verona chiropractic staff is sensitive to the gentle needs of the infant patient and specializes in pediatric care. Parents often comment that they began to see a noticeable difference in the baby's sleeping and eating patterns almost immediately after the start of treatments. Pediatric chiropractic care is a positive and safe way to bring lasting relief to your baby's well being. We invite you to visit our Verona office and experience the gentle and loving family atmosphere. Receive treatment that works and watch your baby move into a position of complete health and wellness. Your infant will be safe in the hands of our caring chiropractic doctors and staff.